cTrader Weekly demo contest, Round 53: $400 for five winners! 1st place with the award of $150 goes to Mr. Puji Harno from Indonesia. 2nd place with the award of $100 goes to Ms. Sutini from Indonesia. 3rd place with the award of $75 goes to Mr. Misran Marbawi from Indonesia. 4th place with the award of $50 goes to Mr. Mahmoud Ahmed Abed Alaziz from Egypt. 5th place with the award of $25 goes to Mr. Prabhulal Rugnathbhai Rupala from India. Don’t miss your chance and open a demo account to participate in the next round of cTrader Weekly demo contest! OctaFX cTrader Weekly demo contest: try to win! 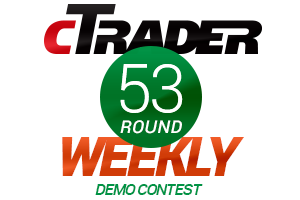 Welcome cTrader weekly demo contest Round 54 winners! One more round of cTrader weekly demo contest is over, and the results of the contest are announced. While our Round 54 winners celebrate their victory, all traders who want to test their trading abilities can join the contest. We are glad to award prizes to the distinguished winners.